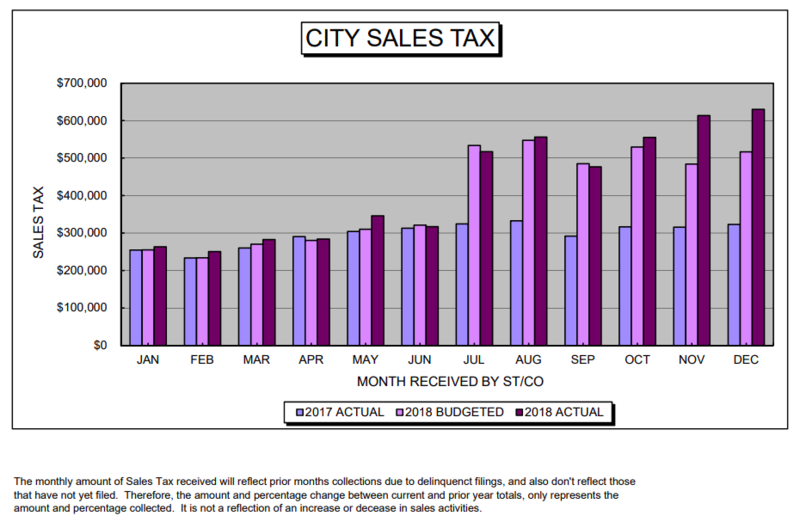 A chart showing city sales tax revenues from 2017, budgeted for 2018 and actual amounts received in 2018. As of December, the city of Craig collected a little more than $5.1 million in sales tax, up by about 43 percent from 2016, when the city collected a little less than $3.7 million. The city also received a little more than $1.6 million, its share of the countywide sales tax, which was up by 23.16 percent from the little more than $1.3 million collected in 2016. Here’s how city tax revenue fared in October, November, and December, the most recent months of available data. The city collected about $555,000 in sales taxes, or 75.54 percent more than the prior year. The amount of city sales tax collected by the county was a slightly more than $121,000 and up 13.94 percent from the prior year. A little less than $613,700 in sales tax, or 94.58 percent more than the prior year, was collected by the city in November. The city’s portion of sales tax collected by the county totaled slightly less than $125,000, up 3.91 percent from the prior year. The upward trend continued in December as the city collected about $630,000 in sales tax revenue. The final figures were awaiting state verification. The amount represented a 94.99 percent change from the prior year. Similarly, the city portion of county collected sales tax added up to about $130,000, or a 5.3 percent increase from the same month the prior year. The final numbers were awaiting verification from the county. City enterprise funds for water, wastewater (sewer), and solid waste (trash) did not fare as well in 2018. The water fund ended the year up by 2.99 percent, at about $3 million. The wastewater fund ended up by 0.72 percent, at about $1.7 million. Fees from construction dumpsters fell for the second year, ending a little less than $128,000, a 25.28-percent decrease from prior years. Fees for solid waste (trash) collection was up 0.95 percent, ending at a little less than $729,000. Landfill fees also stayed steady, with an increase of 0.59 percent from the prior year, ending slightly less than $555,000. Additional data pertaining to the sales and lodging tax revenue collected by the county will be reported in a future story.